Adrian, this pattern is destined to go down in knitting history as a classic and well loved pattern. Years from now knitters will still be talking about its charms. Pamela’s acorn is just the perfect touch, too! Totally and utterly brilliant and adorable! I’m super excited about these mittens. Yay! It’s been torture watching the samples pop up on Ravelry and not being able to get my hands on the pattern. Yay! Squirrels and acorns! Those mittens are adorable!!! I am a newer knitter and am wanting to try stranded knitting. God, I have so many tiny acorn needs… Love this!!! Love the palm pattern especially :). I long to make these … but they’ll have to wait until the Christmas gift knitting is completed. Patience, patience. Thank you for another great pattern. These are beautiful! Will have to add to my ever growing queue! These are beautiful, Adrian! I love the attention to detail–5 iterations of squirrel–and the braid. 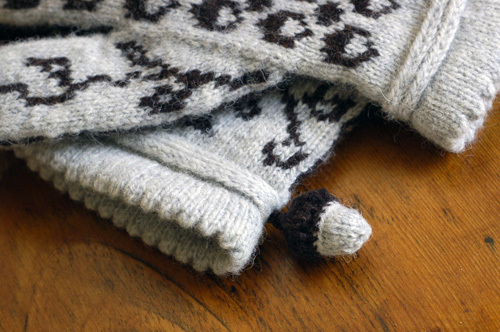 If I ever move to a place with a real winter, I’ll gladly knit these (and the Fiddlehead Mittens)! Oh my goodness, those are so lovely it’s insane. I have a secret fondness for squirrels (especially the ones here – they’re so chubby and dim-looking, how can you no?) 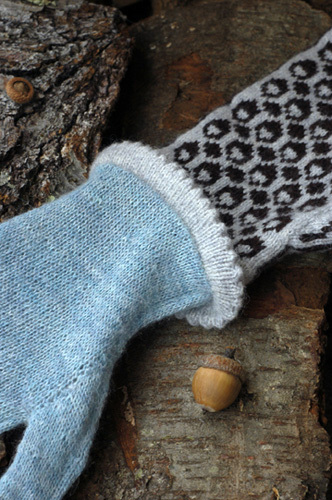 and the second I figure out colourwork mittens, I’m pretty sure I’ll want these in my life. 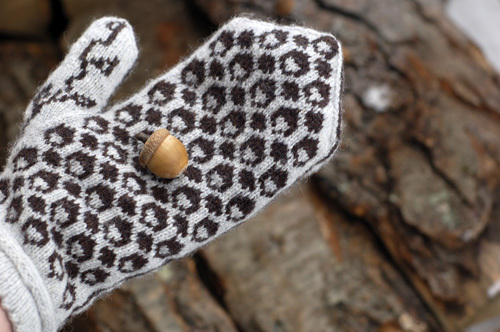 I particularly love the 3-D acorn add on, but even without that, they are truly great mittens. I’m in love. Awesome, totally awesome. these are so cute! i have never been inspired to make mittens before. these may be my first. Another beautiful pattern. I’m curious, I’ve done braids once and I wasn’t satisfied with the join. Could you share how you deal with it? These are awesome! Adding to my queue RIGHT NOW! Thanks! Your mittens are absolutely beautiful. I love that it has a lining. And the stuffed acorn is lovely. I have a pair of mittens I have started (if I can find them again). Do you have any tips for adding a lining? If I can’t find them, then I will probably be buying this pattern and making these. It’s time for some honest to goodness mittens. These are the most amazing mittens. I have a dreadful fear of small needles. You might catch me working on 5s but I will never admit it. But these mittens have me considering and definitely dreaming of squirrels. Hello Yarn: I have been watching your web for years. However, in the last year you have been very disappointing. In the last post you promised to be better and post and have not. I feel so bad when I look to see if you have posted. I need to have only positive feelings in my life so I am deleting your web site. I think you have disappointed many people. bye rosemary! don’t let the door hit you on the way out. killjoy. Love the mittens and love your blog. I’m not disapointed. Oh, no! It’s Rosemary! She’ll delete our blogs! Run! Hide! Gather acorns! Heeee! yikes Rosemary! I thinks you need to get a real life!! I love this blog so move on and get going! Obviously you don’t think others have a life and it all revolves around you! get over yourself! I’m not disappointed nor are others! Heeehee! How can you continue to happily knit knowing Rosemary is disappointed in your website now? OMFG! Omg, you are *such* a disappointment! What with running your own business and dying a ton of fiber for the fiber club and yarn AND fiber for the shop, not to mention designing super-adorable patterns for your shop as well as for upcoming books, one would think you’d have more than enough time to blog religiously. Think of the people, Adrian!!!! On a serious note, I am always amazed when people leave selfish, obnoxious comments that completely do not take into account the crazy amounts of time and energy that go into a creative blog. A, you know you are awesome and we adore you. Keep doing your thang, and eff the begrudgers. Isn’t that what Bloglines are for? I guess I am entirely confused as to a) the whole point of blogs and b) what my reasonable expectations of others should be. Oh, wait, that’s not me. That’s Rosemary. These are beautiful! I love squirrels – and must have them on my mitts ASAP! I also wanted to thank you for writing the “We Call Them Pirates” pattern. I made it for my brother for Christmas and it was a huge hit! He loves it, and my Mom was quite impressed with my knitting skillz (Two l’s in that?)! Anyway, it was a blast to knit and it was fun to make something knitted that has skulls and crossbones on it! Thanks so much! Do you realize there have been no new blogging since last year??? Do you know what effect that has on me??? 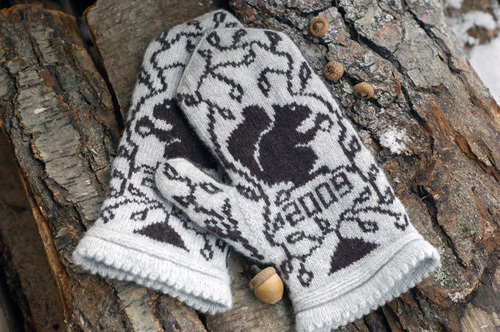 LOL….Can’t wait to see you at YS and I love those little mittens….naughty squirrels..
What a lovely pattern! Thank you. They were fun to knit and are my faves to wear. I also wanted to thank you for the “We Call Them Pirates” hat pattern. I cut my fair-isle teeth on that one, and it is probably the pattern I’ve knit the most. These are absolutely amazing. I must put these on the top of my must-knit list for 2010. Your designs are just awesome!